Rice with Angel Hair Pasta. Photo © N. Gaifyllia, licensed to About.com, Inc. This is a fabulous alternative to a plain rice dish. The angel hair pasta is sautéed until brown then cooked with the rice. An easy dish to make and delightful on the table. Bring olive and butter to high heat and add the pasta. Sauté until it browns. Add water or stock. 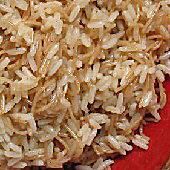 When full boil is reached, add the rice, reduce heat, and cook until the liquid is absorbed (uncovered), about 20 minutes.